All would agree that being an ethical private investigator is important. It is critically important to the individual private investigator, and to the profession overall. Simply stated, ethics is a system of moral principles. Others say ethical behavior is “Doing the right thing all of the time.” Unfortunately, what is a moral principle for one person, or the “the right thing”, is not the same for another in the same situation. Private investigators are no different. Each define ethical behavior slightly different from another. 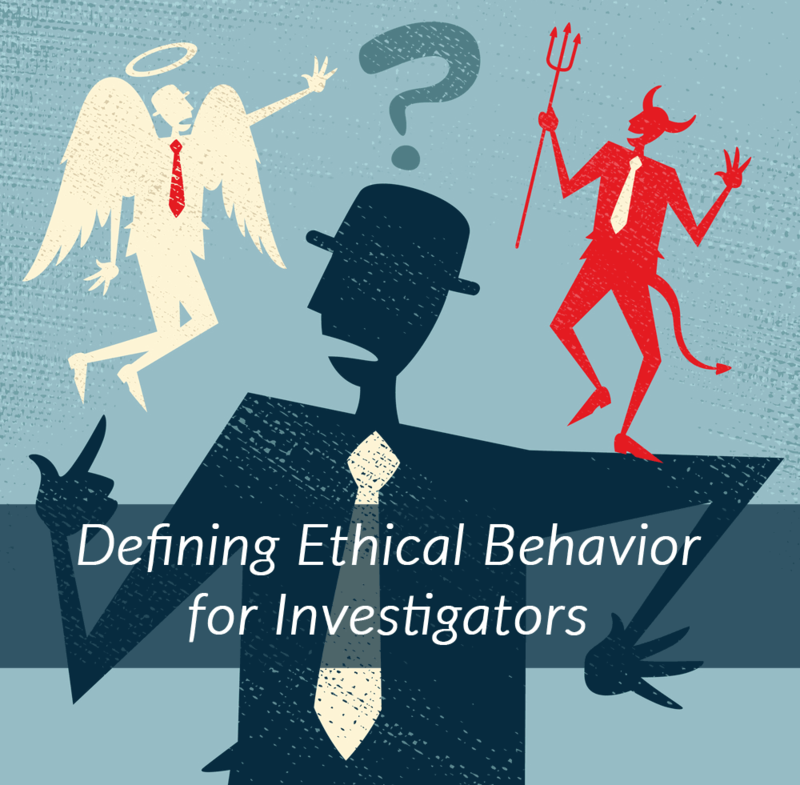 Some argue that defining ethical behavior as a private investigator can be tricky. It is really simple. The baseline for defining ethical behavior starts with following the law. “It is important for private investigators to understand federal and state laws in order to make sure they are not breaking them.”1 Following the law is a great start. Identifying moral principles, that further define ethical behavior are critical to being an ethical, private investigator. Honesty is being forthright, having integrity in all business dealings and actions. Taking improper shortcuts, or misrepresenting the facts is never considered honest, ethical behavior. If you say it, write it, or otherwise, utter it, it must be truthful. In other words it must be a fact. A fact is something that is proven. Consistently exhibiting strong moral principles. The key word is consistently. Honesty and truthfulness are a part of having integrity. Integrity means more. In simple terms, having integrity is being honest, truthful, doing the right thing consistently all of the time, even when no one will know any different. For example; your research for a case took 30 minutes. When recording your billable hours you charge for one hour. Chances are no one will confront you, or be able to disprove your claim. Having integrity is reporting it as 30 minutes. “I didn’t have another choice!” - You always have an ethical choice, and if there is no ethical way to accomplish something, then don’t. “I didn’t know it was against the law!” - You are a professional private investigator. You are expected to know the laws. “That’s the way I’ve always done it!” - Just because you have been unethical in the past and didn’t get caught, that doesn’t make it ethical the fifth or the one hundredth time you do it. A simple way to determine if an action you are contemplating is ethical is to apply the “Reality Show Test”. Consider you are the star of a reality show and every thing you do is recorded, then broadcast for everyone to see. Ask yourself, “Would I do it differently if everyone could see me?” If the answer is “No”, then continue. If the answer is “Yes, you would do it differently”, then reconsider your next steps. Still not sure? Then consider other alternatives, or talk it over with a colleague you know to be ethical. Being honest, truthful, and having integrity in all that you do will ensure you are taking the ethical path. Being an ethical private investigator increases your professionalism, builds your reputation in a positive way, and ensures you are providing your clients with the best services possible. Consider your reputation as an investment. You must build on it every day and not risk throwing it away with one unethical act. Bruce Holmes is an experienced law enforcement officer with over 24 years law enforcement experience. Bruce is the owner of Holmes-Tech LLC, a company experienced in providing technology solutions for attorneys, private investigators, security professionals as well as a founding partner of ProPiAcademy, a Top Private Investigator Training Program that provides online education for private investigators.